Last year saw Hampshire engage in a stellar Royal London One-Day Cup campaign, leading James Vince's men to victory in a Lord's final. With just one week to go until the 50-over format arrives at the Ageas Bowl, where Hampshire take on Glamorgan on Friday 19th April (Good Friday), the players took a fond look back at what was a memorable day. Take a peek at the video below to see what the champs had to say and revisit one of the club's greatest trophy wins in recent memory. 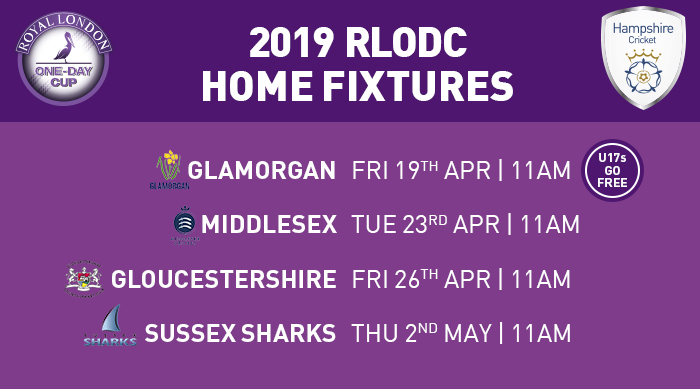 Catch the champions in action from next week, with Kids granted free entry to Hampshire's opening 50-over fixture against Glamorgan on Good Friday and three more exciting white-ball clashes following swiftly. Tickets are available to purchase via the link below, or by contacting the Ageas Bowl Ticket Office on 0844 847 1863 or via tickets@ageasbowl.com.